The Father Hope series started some years back as collaboration with various priests and clergy. The intent of the books and the new novella was to provide guidance in facing today’s spiritual challenges. 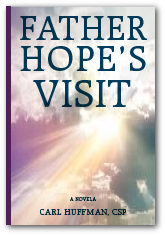 The latest, Father Hope's Visit – a novella short story, is about the Ten Commandments updated to 2014. It asks, are we worshiping other idols in place of God, how are we showing our love for one another, how are we coveting our neighbors, and honoring the Sabbath, plus the rest of the Commandments. All of these feature Father Hope as the central character to make the reading more enjoyable and to get the message across. 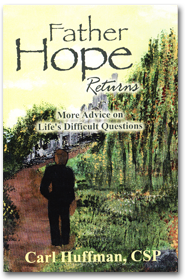 It is my hope that once you read Father Hope you will fall in love with the character as I have in writing about him. 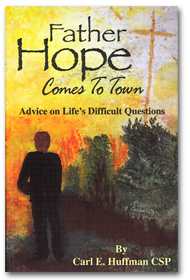 Father Hope Comes to Town addresses issues of death of a loved one, miracles, angels, two very poignant stories about faith and a lost soul’s return to the church plus many more. Father Hope Returns continues the stories with our life with God, prayer, devotion to the Virgin Mary, love and much more. Father Hopes Visit - Re-visiting the Ten Commandments is a novella that seeks to update the message of the Ten Commandments for 2014.